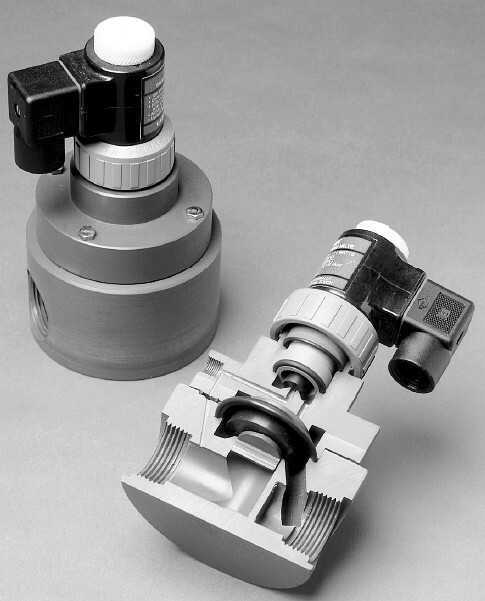 Pilot-Operated, Normally-Closed PTFE Bellows Seal Solenoid Valves Series PS – Plast-O-Matic Valves, Inc.
1,000,000+ cycle bubble-tight design; over 2,000,000 cycles has been achieved in field use. No metal parts in wetted area. Uses line pressure to assist operation, which allows extremely high Cv performance, as well as outstanding pressure ratings. 11 watt/Nema 4X CSA approved water and dust tight enclosure. All valves are individually inspected and 100% tested. Optional coil connector light indicates when valve is energized. Click here for brief video of how Series PS works. Requires 5 psi greater pressure at inlet to function properly. With proper differential, Series PS is normally closed (energize to open). Inlet pressure can be as high as 140 psi; backpressure (outlet) can be as high as 70 psi — as long as the outlet pressure is 5 psi lower through the entire operating range. When the signal is sent to close the valve, it takes about a second for the pilot pressure to overcome the process pressure. Once the pressure is overcome, closure is instantaneous, and potential for water hammer must be considered prior to specification. Designed for pressure service; suitable for drain applications as long as 5 psi differential is maintained. Not designed for vacuum service. Not suitable for liquids containing particulate unless a .007 filter is used. Not suitable for liquids which tend to precipitate solids. Series PS automatically shuts off flow of highly corrosive and ultra-pure liquids. They can handle acids, caustics, solvents, chlorine solutions, sodium solutions, deionized water, reverse osmosis water, brewery processes, etc. as long as a 5 psi differential is maintained. Series PS is not suitable for solutions containing particulate matter or solutions that tend to precipitate solids. Care should be taken when processing liquids prone to crystallization, such as salt solutions, etc. The internal workings of the PS valve can be adversely affected by crystallization. If you have any questions, please contact our technical group at (973) 256-3000. Valves are normally closed by inlet pressure on a diaphragm over the main orifice. When the valve is energized and the pilot orifice is opened, the pressure above the primary diaphragm is released downstream. Once this pressure is released, the pressure below the main diaphragm forces it to open. When the valve is de-energized, pressure is returned to the top of the diaphragm, forcing it to close. The action of the pilot and diaphragm result in a slight delay in the opening and closing, generally a second or two. (Note that without the 5 psi required differential, the pressure above the primary diaphragm will not be released, and the valve will not function properly). Available in 1/2″, 3/4″, 1″, 1-1/2″, 2″ & 3″ NPT sizes. Not all materials available in 2″ or 3″ sizes: 2″ PS available in PVC, PP & PVDF. 3″ PS available in PVC only. If your size and material needs differ, please contact factory. After 1,000,000 cycles, we recommend that the valve be disassembled and inspected. It is also recommended to replace the elastomer seals at this point. Contact your distributor for a seal kit. For heavy use applications, you may wish to order a spare seal kit with the valve. Seal replacement takes but a few minutes with common tools; no special training is required. **This rating is for PVC. Consult factory for other materials. Note about Particulate: Liquid media should be filtered with 80 mesh (.007) filter or finer. NOTE: Optional body and seal materials are available, depending on specifications, lead time, and quantity. 2″ PS available in PVC, PP & PVDF. 3″ PS available in PVC only. 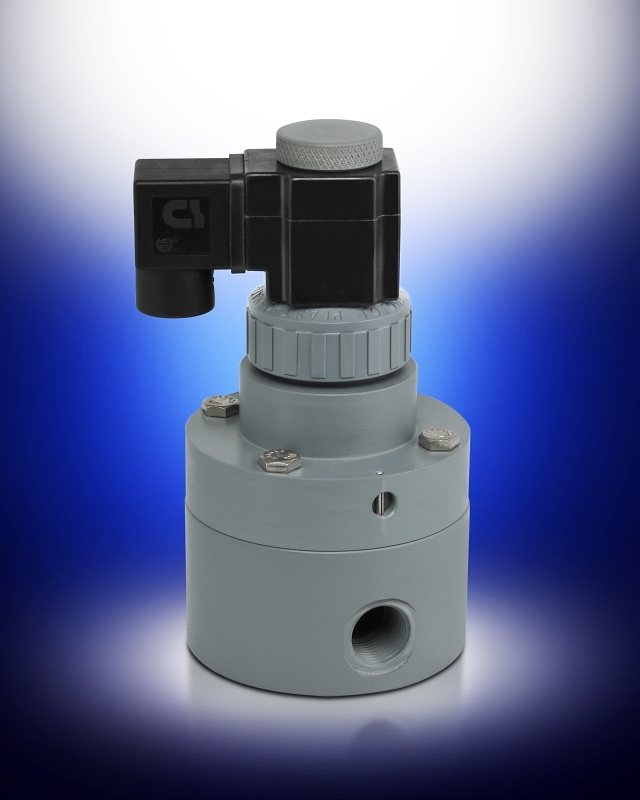 The valves compared are 1″ NPT pilot-operated solenoid valves, with PVC bodies and FKM seals. (FKM is often compared to the brand name Viton, which is a registered trademark of DuPont Dow Elastomers) Prices are per catalog, January 2001, and are subject to change. The Plast-O-Matic valve has a 9.5 Cv rating with a rated pressure range of 5 – 140 psi. The competition’s valve has a 10.3 Cv rating with a rated pressure range of 7 – 85 psi. Plast-O-Matic recommends inspection at 1,000,000 cycles. Assuming a rebuild kit is required — and it may not be — the valve can be returned to like-new condition in a few minutes, without any special training. Cost of the rebuild kit is $155. Even when competitive valves are priced hundreds of dollars lower, Plast-O-Matic users still come out way ahead in terms of cost per cycle. For example, if the initial cost of the other valve were $174, the total life cycle cost in this comparison would still be $166 more than Plast-O-Matic…not to mention the staggering cost of multiple downtimes. Determining Amperage for a Plast-O-Matic Solenoid Valve This is a technical document in Microsoft Word format that explains how to calculate the amperage required for Plast-O-Matic AC or DC coils.